In a jam-packed San Luis Obispo County Board of Supervisors meeting Tuesday that was testy from the start, an incident occurred that occupied the frenzied crowd’s attention for just moments, but was in its own way momentous: A sheriff’s deputy ejected a man from the meeting. The ejection was clearly illegal. Remember those pesky First and Fourth Amendments of the U.S. Constitution? Then, the next day, something a little more important happened: Sheriff Ian Parkinson described the incident in a 500-word written response to CalCoastNews’ query that, not surprisingly, blamed the victim. Parkinson also labeled the deputy’s actions as “legal.” Surely, the sheriff must know better. Mike Brown is hardly your typical victim. He is the government affairs director of the Coalition of Labor, Agriculture, and Business (COLAB), which, depending on your perspective, is either a group of regular county folks with interests in the three enterprises mentioned in their name or a crazy right-wing lobby. 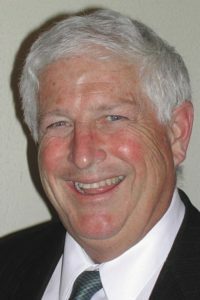 As part of his job, Brown, a former Santa Barbara County CEO, appears at every meeting of the supervisors, taking notes and preparing a regular bulletin to members delineating issues and proposing positions. These are not unique practices in this free nation. For this particular meeting, with the chairmanship of the board at stake, a gaggle of very contentious folks filled the chambers advocating two decidedly different objectives — to back or to oppose the election of Adam Hill to the board’s leadership. Anticipating this over-charged atmosphere, Supervisor Lynn Compton said she asked Parkinson to provide a couple of deputies to attend. Brown utilized his three minutes allotted to each speaker during the public comment phase of the meeting. But a little later, following repeated condemnation of his organization and its members by Hill and fellow supervisor Bruce Gibson, Brown left his seat while addressing the board: “Point of order,” he said. Instantly, a roar went up from the pro-Hill, anti-COLAB part of the crowd. And just as quickly, the young deputy dashed past me, grabbed Brown by the arm, turned him around, and escorted him from the chambers. As he passed, Brown said to me, “This is a violation of my constitutional rights.” And about that, he was absolutely right. Despite Parkinson’s hollow assertion, Brown was not “clearly disrupting” the meeting. His actions and request were entirely appropriate according to parliamentary rules, Compton later told CalCoastNews. She did not ask for Brown to be removed from the chambers, but noted that she would have declined his request to speak. It’s enlightening to know what transpired outside the supervisors’ chambers (a CalCoastNews reporter followed, taking notes). The deputy planned to bum’s-rush Brown from the building itself, but did not. 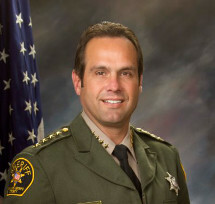 After Brown articulated his rights regarding his actions, the deputy allowed him to return to the meeting. The deputy, who will remain unnamed here, was clearly on alert for potential trouble. He acted on his best judgement to deal with both situations, first the ejection, and then the correction. But Parkinson’s view of the incident begs the question: Does the department’s top gun understand the law in this case? His response (included in full at the bottom of this opinion piece) suggests his willingness to downplay the seriousness of the situation and to deflect the blame from his own leadership. The key word in all of this is “disruption.” California law allows removal of individuals “who willfully disrupt the orderly conduct” of public meetings. So, in a setting such as this, who determines when a disruption is occurring? Of course, a fist fight would be the kind of disruption that would demand an attending deputy to react instantly without being asked, no question. But less intense situations, such as a citizen asking for permission to be heard on a parliamentary procedure, are properly dealt with by the governing body’s chair. It was not proper, and Parkinson should man up and admit it. Deputies are authorized by law and department policy to do just about everything Parkinson said in his response to CCN — except what the deputy actually did. There’s that word “disruption” again. Both local newspapers reported the incident, albeit briefly, suggesting only that Brown left the chambers, followed by the deputy. Neither of these defenders of free speech seemed to recognize that Brown’s muzzling was inappropriate, illegal and now, unrepented by Parkinson. Or he might have been more candid, admit the deputy’s action was taken with the best of intentions but nonetheless in violation of Brown’s rights, and that the matter was being handled internally. Also simple. In any organization, moral and legal guidelines are established and enforced by those at the top. Parkinson knows this. ‘Nuff said. “Thank you for your questions and concerns regarding Tuesday’s Board of Supervisors’ meeting. “Just by way of clarification, the Deputies present at the BOS meeting were at the request of the BOS Chairperson. Deputies are not regularly present at BOS meetings unless there is a belief from the BOS that a particular meeting might be contentious and Deputies might be needed. It is always my hope the mere presence of a Deputy will prevent a disturbance and allow everybody the opportunity to voice their opinion or concerns. “The Board of Supervisors is authorized by the Brown Act to remove individuals who willfully disrupt the orderly conduct of Board meetings, and may utilize the services of Sheriff’s Deputies in facilitating the removal of such individuals. The Sheriff may always exercise his/her authority to quell breaches of the peace and to enforce provisions of the Penal Code, whether the offending conduct occurs within or outside of the Board Chambers. “Both the United States and California constitutions protect the right of free speech and expression. The “content” or “view point” of speakers addressing the Board must not constitute a basis for removal. The Board, under the Brown Act and the Government Code, allow the public to speak for a period of three minutes and there are very few restrictions on what a speaker can and cannot say. Outside of the speakers allotted time period or being called upon by the BOS, a member of the audience does not have a right to disrupt the meeting. The disruption of the meeting is cause for removal or the stopping of the meeting. “In this particular case, Mr. Brown had already been given his three minutes to express his opinions; was not called upon by the Board Chairperson; and was clearly disrupting the meeting by speaking from the audience. He was in fact approached by a Deputy and asked to leave the BOS chambers. You indicated that Mr. Brown stated the Deputy said to him, “I can’t allow you to voice your opinion.” The Deputy states that he told Mr. Brown, that he could not disrupt the meeting to express his opinion. “I believe Mr. Brown to be an honest man and I think it is fair and reasonable to understand that with all of the noise the disruption created, what the Deputy stated might not have been clearly discernible or was misinterpreted. “You are correct, Mr. Brown was escorted out and was allowed to reenter the chambers a short time later. That was done at the Deputy’s discretion, fully believing that Mr. Brown would not continue to disrupt the meeting. He was obviously correct in this assumption, as there were no further disruptions. “The Sheriff’s Office is non-partisan and does everything possible to avoid the appearance of taking sides. A Deputy has the duty in this situation to keep the peace and ensure that the meeting is not disrupted. When a meeting is disrupted, it is interfering with other attendees right to be heard. I believe the Deputy’s actions to be professional, appropriate and legal. CCN Senior Correspondent Daniel Blackburn is not a member of COLAB and can be insulted at blackburn.danielj@gmail.com. After reading Browns opinion piece on this website I can see why one would want to eject him.